Kris Meeke says his Citroen works drive on Rally Finland is the biggest opportunity of his career. The Northern Irish driver is a former winner of the Intercontinental Rally Challenge title with Peugeot Sport and he contested six world rallies with Prodrive's Mini team, but this is the first time he has started a world championship round in a full factory car. Meeke will test the DS3 WRC for one day before the event. 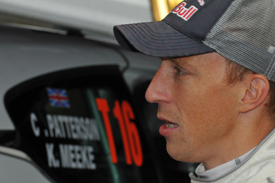 "There's no question this is the chance of my career," said Meeke. "It's incredible. I'm going to the biggest rally in the world in a factory car with a world champion team - it doesn't get any bigger than that. "I know what I can do in a car. I just needed a chance and now I've got it. Now I have to make the most of it. "Finland is an incredible rally, but it's also one of the toughest and making my competitive debut in a car like the DS3 WRC on an event like that is going to be huge. "What's very important for me, though, is that expectation is kept in check - this is my first event in a long time." Meeke will be driving Khalid Al-Qassimi's Citroen, with the Abu Dhabi star unable to make the next round of the world championship.